David Graves doesn’t seem like a law-breaking custom buster. Jelly, Ginger Jelly, and Hot Strawberry Jam, from their front yard stand in western Massachusetts. Graves even does a brisk business with an almost forgotten sweet-tart syrup called switchel that New England farmers long ago drank by the ladleful out in the hay and cornfields. His recipe, which calls only for ginger, raspberry vinegar, a touch of sugar, and well water, now provides traditional refreshment in the urban jungle. But David’s operation took a decidedly nontraditional turn in the 1990s. 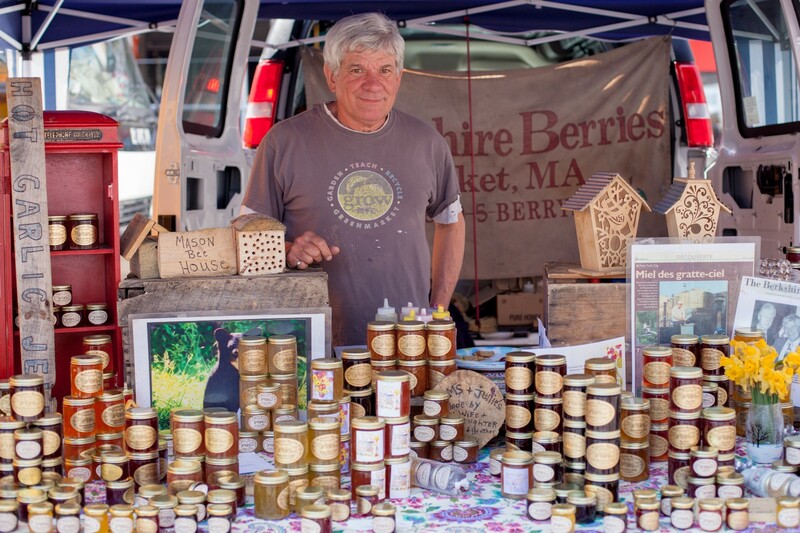 It all began when black bears, hungry after hibernation, raided Graves’s Massachusetts hives of their honey payload, and he experimented with elevating his remaining hives out of ursine reach. One day, sitting in traffic on the way to market, he looked up at the skyline and realized that there are no bears on city rooftops. An idea was born. Greenmarket office on East 16th Street, two blocks east of Union Square. 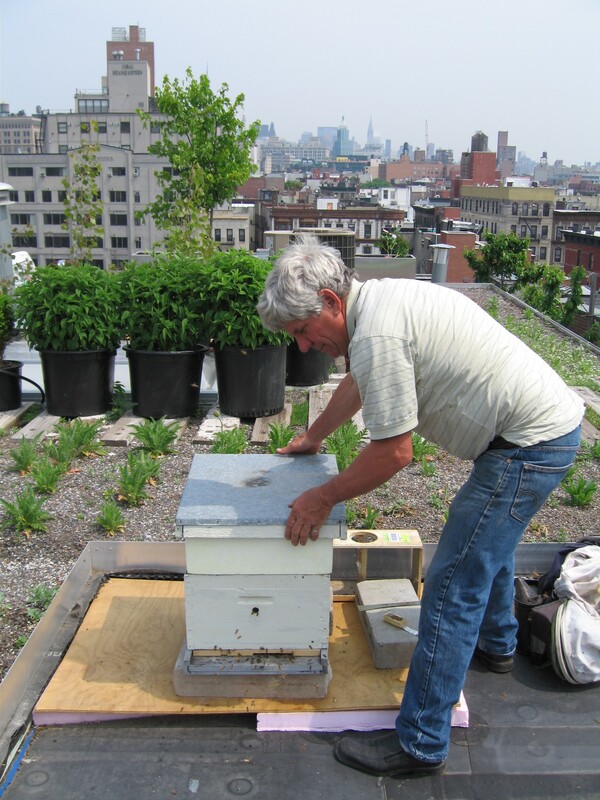 David tending to one of his rooftop hives in New York City. Manhattan flora, collecting pollen and nectar from window boxes, parks, and the flowering trees that line so many city sidewalks. Linden, gingko, sumac, and black locust, along with a profusion of ornamental gardens, give the urban jars a more floral flavor than his clover-feeding Berkshire bees. Rooftop owners are “paid” with honey. tends a half-dozen, aware that there aren’t enough flowers in the city to nourish endless numbers of hives. But while his multistate operation — with a half-million bees, as well as an accompanying network of tenants, apartment owners, and landlords — may seem far removed from his early days, it all maintains the earnest feel of that 1970s front yard stand where locals slipped their payment into a wooden box and came back to return the jars, albeit with a city twist. This story is excerpted from The New Greenmarket Cookbook, by Gabrielle Langholtz and available from DA CAPO PRESS/Lifelong Books. Want to learn more about GrowNYC and our $40 for 40 campaign? Visit http://www.grownyc.org/blog/greenmarket-40-40. Stories from the Greenmarket community as we celebrate 40 years of bringing healthy fresh local food to NYC.